First things first. It is not a comprehensive guide. Nor is it exhaustive. But we’ll keep updating it to include all the important stakeholders and ensure that it doesn’t become obsolete with time. It has been almost eight months since I last visited Egypt but I continue to engage with different stakeholders of the local tech startup ecosystem online so I have a decent idea of what’s going on there. This guide is based on my personal exposure and interactions with these stakeholders. But it is the first edition. I welcome all of you to recommend changes or share updates to make it better. For now, it should serve as a basic guide to anyone who wants to understand what Egypt’s startup ecosystem looks like. From big deals to new incubators and accelerators to government support, there has been a lot of activity in the country lately so it is perhaps the right time to put this together. The ecosytem map (infographic) is powered by trackMENA (just leaving it there for now – will share the details very soon). Until few years ago, the only startup accelerator in Egypt was Flat6Labs but things have changed pretty quickly in the last one year or so with many new accelerators helping the startups. These include EdVentures, an ed-tech accelerator started by one of country’s leading publisher, Falak, a government-run accelerator for early-stage startups, TechSpace, an incubator by Nile University for blockchain startups, and many others. Flat6Labs Cairo often receives criticism for offering a very small amount of money for the equity it takes in startups that join its program but continues to attract some very promising startups of the country which suggest that they must be doing something right (or that there are still not enough options out there). Apart from their early cycles that included names like Instabug, Nafham, and Taskty, their recent cycles had startup like MoneyFellows and Harmonica, which went on to raise follow-on funding. AUC Venture Lab’s acceleration program also seems to have a pretty decent reputation among startups in the country. They don’t take any equity as there’s no money involved but seem to offer good level of support to participating startups. 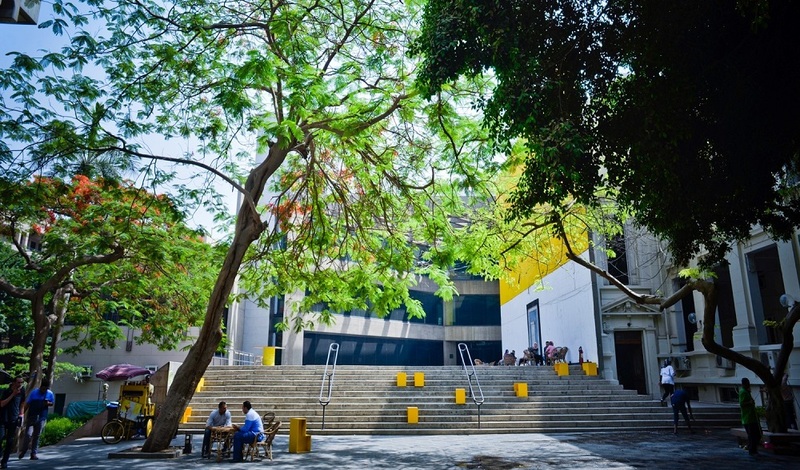 The Greek Campus, a tech park (or hub or whatever you’d like to call it) is located in the heart of Cairo’s downtown that hosts different local, regional, and international stakeholders including startups. From RiseUp and Udacity to MO4 and Flat6Labs, it’s home to some of the most influential players of Egypt’s startup ecosystem. But I keep hearing that it’s not longer an affordable option for startups. If you’re in Cairo for a day and you would like to meet Egyptian startups and other stakeholders from the ecosystem, this is the place you should be at. My Facebook feed is full of new co-working spaces opening in different cities of Egypt. I see at least one such story every few weeks. What’s interesting is that a lot of regional and international players are also trying to open up their spaces in Cairo and other cities of Egypt. From Seedspace to Startup Haus by Enact, many have already opened some of the most beautiful spaces in Cairo already. One of the oldest co-working spaces in Cairo is AlMaqar that now has its branch in The Greek Campus as well. AlMaqar is known for regularly organizing different meetups and activities, both for their occupants and tech community in general. Another Cairo space that seems pretty active these days is Urban Station. In Alexandria, IceAlex is one of the leading spaces in terms of activities and events they organize and one of the beautiful spaces of the country, G Space, is located in El Gouna. There has been a lot of activity lately in this category as well with many new VC funds and angel groups being launched. Algebra Ventures, the largest Egyptian fund ($50 million) that was announced made few investments last year and has been active this year as well, investing in La Reina & POSRocket. Algebra’s average ticket-size is $500K or more, larger than most of the VCs currently active in Egypt. Sawari Ventures, one of the first VCs of the country is expected to launch their new fund of $55 million soon. Khaled Ismail, a famous Egyptian angel investor launched an angel fund of $5 million and has been pretty active making more than 10 investments until now. Endure Capital, the early-stage VC with offices in United States, Dubai & Cairo continues to be active in the region with more than three investments in Egyptian startups this year. Averroes is another Cairo-headquartered VC firm that became active last year with their investment in Egyptian breakfast delivery startup Breadfast. Investing up to $100K in startups all across MENA (and beyond), the firm is expected to announce at least a couple of deals this year as well. A15 that has some very promising startups in its portfolio and continues to stay active with an investment here and there. In terms of angel groups, Cairo Angels clearly leads the pack with companies like Instabug, Eventtus, HireHunt, Bosta & Orcas in their portfolio. Newly formed Alex Angels has made only one investment so far and there have been announcements of couple of more angel groups including one by the American University in Cairo but they’re not really active yet. Regional VCs have been showing a lot of interest in the Egyptian startups lately. One of the reasons is that they normally end up getting more favorable terms than they would if they make the same amount of investment in a similar early-stage startup in UAE, Kuwait, Saudi or Jordan. This is especially valid if the startup is building a global product. Some of the recent investments in Egyptian startups have been made by Kuwait’s Arzan VC, UAE’s BECO Capital, Oman’s Oman Technology Fund (through its Wadi Accelerator and the main VC fund), and Silicon Badia. But 500 Startups’ MENA fund that goes by the name of 500 Falcons continues to be the most active VC in the country. There are very few international VCs that have made investments in Egyptian startups lately but that’s probably because most of the startups in the country are early-stage. Vostok New Ventures currently seems the most active international VC in the country (500 Startups is also obviously a global name but because they make investments through their regional fund, let’s just refer them as a regional player – or as it suits you) with investments in Bashar Soft (Wuzzuf) and Vezeeta. Egypt’s government has been very active lately, launching different programs to help the startups. Most of these programs have been launched under Ministry of Investment and International Cooperation’s initiative called Fekratek Sherkatek. Egypt Ventures, which is a part of this initiative invests in VC firms and accelerators. It is one of the investors of Flat6Labs. The initiative also runs a four-month acceleration program Falak Startups Accelerator that offers funding, office space, and mentorship to the early-stage startups. In terms of NGOs, Endeavor Egypt and Injaz Egypt are pretty active. Endeavor Egypt supports high-impact entrepreneurs of the country. In addition to leaders of different high-growth businesses from different industries, the organization has many tech entrepreneurs in their network as well including the founders of Eventtus, Vezeeta, and Bey2ollak. Injaz Egypt is known for organizing different programs for the youth in the country, some of these programs are aimed at startups in Egypt. Their most recent program in collaboration with TehcWadi took 14 promising startups from the country to Silicon Valley to help them further develop their entrepreneurial skills by networking with different tech companies there. RiseUp Summit without any doubt is the biggest startup event of Egypt. The summit that is held on annual basis at The Greek Campus in Cairo attracts thousands of founders, investors, tech enthusiasts and other stakeholders from entire MENA, Europe, United States and even Asia. If you’re someone who would like to get a sense of what Egypt and MENA’s startup ecosystem is like, this summit is a no brainer. One of the recent additions to startup and tech events in Egypt is the Vested Summit (Disclosure: I was part of the organizing team of their first edition). The brainchild of two Egyptian female entrepreneurs and organized by a team led by four women, Vested Summit’s first edition was held in El Gouna to start a global movement for conscious tech – technology for human good. The event hosted different local, regional and international speakers and attracted startups and entrepreneurs from all over Egypt. Techne Summit – another startup and technology event that is organized on annual basis in Alexandria has also made some noise but they still have a lot of catching up to do. When you think of exits from Egypt, the first name that comes to mind is Fawry – the FinTech startup that was reportedly acquired by a consortium of investors for $100 million. Another high-profile acquisition was of Kngine, the artificial intelligence startup acquired by Samsung last year for an undisclosed amount. There have been many other small acquisitions here and there but these two are the most notable ones. As explained above, this is a pretty basic guide but we’ll continue updating it with your feedback to make it better. Please feel free to share any feedback that you may have by reaching out to me directly at zubair [at] menabytes [dot] com.